The seatbacks of the rear seats can be folded down. Pull the seatback lever in the trunk for the seatback you wish to fold down. 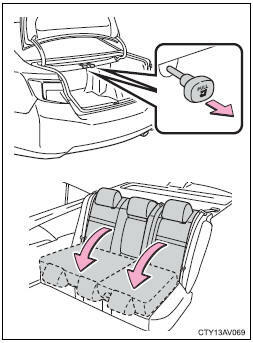 ■When folding the rear seatbacks down Observe the following precautions. Failure to do so may result in death or serious injury. ●Do not fold the seatbacks down while driving. ●Stop the vehicle on level ground, set the parking brake and shift the shift lever to P.
●Do not allow anyone to sit on a folded seatback or in the trunk while driving. ●Do not allow children to enter the trunk. ■When returning the seat to its original position ●Ensure that the seat belt does not get caught between or behind the seats. ●If the seat belt has been released from its guide, pass the seat belt through its guide. Be careful not to get hands or feet pinched between the rear console box and the rear seat when folding down the rear seatback. ■After returning the seatback to the upright position Observe the following precautions. Failure to do so may result in death or serious injury. ●Make sure the seatback is securely locked by pressing it forward and rearward on the top. ●Check that the seat belts are not twisted or caught in the seatback. ●Make sure that the seat belt is passing through its guide. ■When left seatback is folded down Make sure the luggage loaded in the enlarged trunk will not damage the webbing of the rear center seat belt.